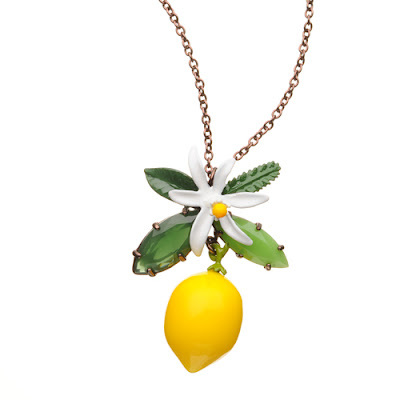 French fashion jewelry maker Les Nereides just came out with several pieces named Au soleil de Provence. It might not be exactly along the lines of Dame Elizabeth's estate, but just looking at the fleurs de citronier made my day better (it's been snowing here all day and more is coming tomorrow). They also have matching earrings that unfortunately are only for pierced ears, otherwise I'd have scooped them up right away (or rather the online shopping equivalent of scooping). Ah, I love Les Nereides! Which is not bad for my wallet as they are a bit on the pricy side, so I try to get them only on sale. This year's collection is one of my favorites in recent years, all green leafs, flowers and juicy fruits. It would look lovely against a simple white blouse. I love it.